In Movie Musical Challenge, I'm watching 20 films I picked as great films or films I wanted to watch. This post is about the 1948 musical Easter Parade starring Judy Garland and Fred Astaire. 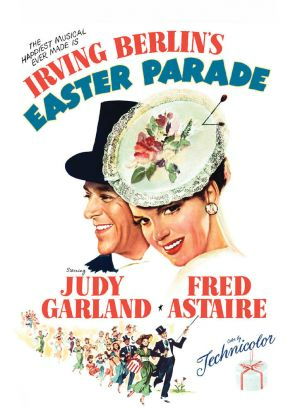 Easter Parade is a charming film, but without a lot of substance. Fred Astaire and Judy Garland are a great onscreen match though - they had good chemistry and a sweet romance ultimately. And of course their dancing together was excellent. The film is a kind of a Cinderella story, with Judy's character Hannah, being primed by Astaire's character Don to becoming a big star of the stage. Their ups and downs as a performing couple, and then as a romantic couple are shown, but it's strange that their romance was a bit of a surprise. Although they had chemistry as performers, I felt like they didn't really show how that developed romantically until Hannah was suddenly sighing over Don. Being such a fan of romance, I'm sure if that was developed gradually, I would have loved this film more. The music is good, but surprisingly unmemorable to me. I can't even pinpoint a great musical moment - the only one perhaps that stands out above the rest is "Stepping Out With My Baby" which features Fred Astaire, and some awesome dancing. And an interesting slow-mo sequence of him dancing, while the back up dancers look to be dancing in real time. It seemed a little odd for that bit of technical filming to be included in this, when everything else in the film was pretty straightforward, but it was cool to watch. Originally Gene Kelly was cast in the male lead role, but had to back out when he broke his ankle, so a part of me is sad that I can't see what Gene would have done with the part, because while this is a nice film, it doesn't particularly stand out to me. Perhaps the biggest draw is the fact that it features Judy Garland and Fred Astaire together, and for that I can recommend giving this a watch.